Cerulean Warbler outfitted with light-level geolocator unit. Photo by Lesley Bulluck. Birds often reveal their presence to us through their vocalizations, before we even have a chance to see the bird itself. This is especially true of the Cerulean Warbler, whose buzzy song is delivered emphatically from high in the canopy of mature trees. Craning your neck to catch a glimpse of a singing male is well worth it: the Cerulean Warbler takes its name from the male’s rich blue plumage. In Virginia, this tiny warbler breeds in large forests in the mountains, making an annual long-distance migration from its wintering grounds in Latin America. Cerulean Warbler habitat. Photo by Lesley Bulluck. Unfortunately, populations of Cerulean Warblers have declined dramatically over the last few decades. According to Partners in Flight, their populations fell by 72% between 1970 and 2014. 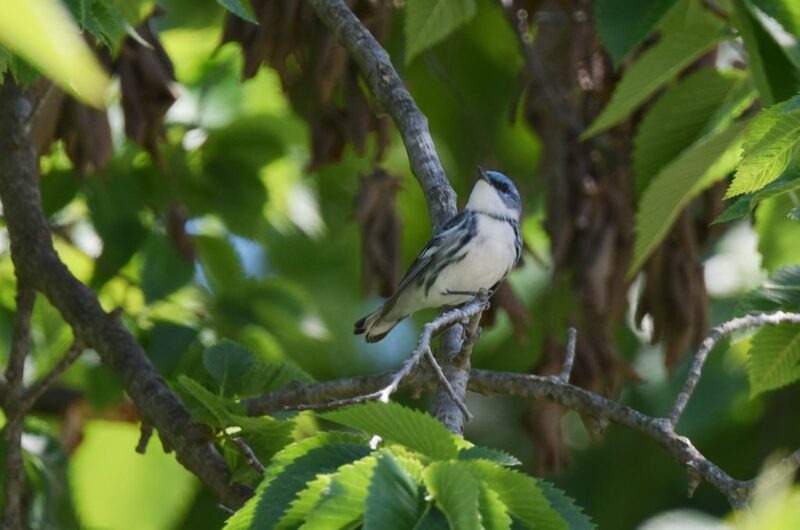 The Virginia Wildlife Action Plan lists Cerulean Warbler as a Species of Greatest Conservation Need, tying its declines to loss of breeding habitat. Nationally, Cerulean Warblers breed in hardwood forests on slopes, ridge tops and along rivers in the Appalachians and Midwestern states. However, given that these birds spend their winters in Central and South America, it is worth investigating whether factors there are also impacting the bird’s populations. A team of researchers working across ten states is beginning this important study by first determining exactly where Cerulean Warblers’ wintering grounds are located. 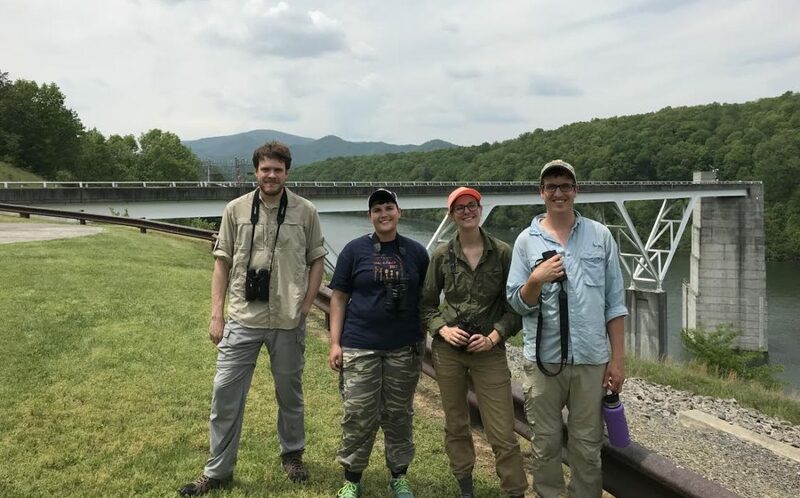 Here in Virginia, the research team consists of a partnership between the Department of Game & Inland Fisheries (DGIF), Virginia Commonwealth University (VCU Department of Biology and Center for Environmental Studies), The Nature Conservancy (TNC) and the Virginia Society of Ornithology (VSO). VCU field crew. Photo by Lesley Bulluck. 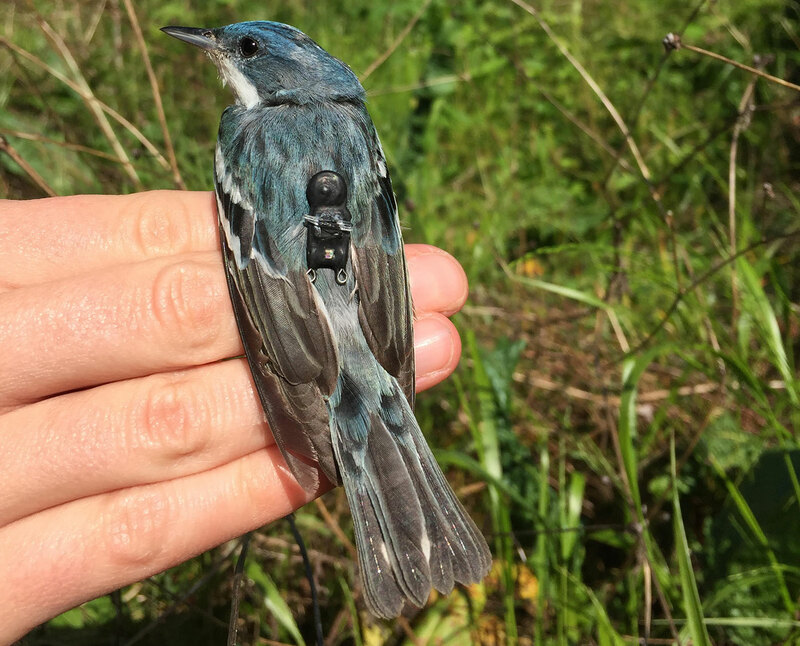 The Cerulean Warbler study relies heavily on technology; researchers outfit the birds with light-level geolocator units, tiny data-collecting devices that allow researchers to roughly track the bird’s whereabouts over a year. Because the units cannot transmit data, researchers must retrieve the geolocators in order to download and analyze the information collected. VCU leads the hands-on field work in Virginia, with the other partners (DGIF, TNC, and VSO) contributing funding for the purchase of the geolocators and support of the field work. 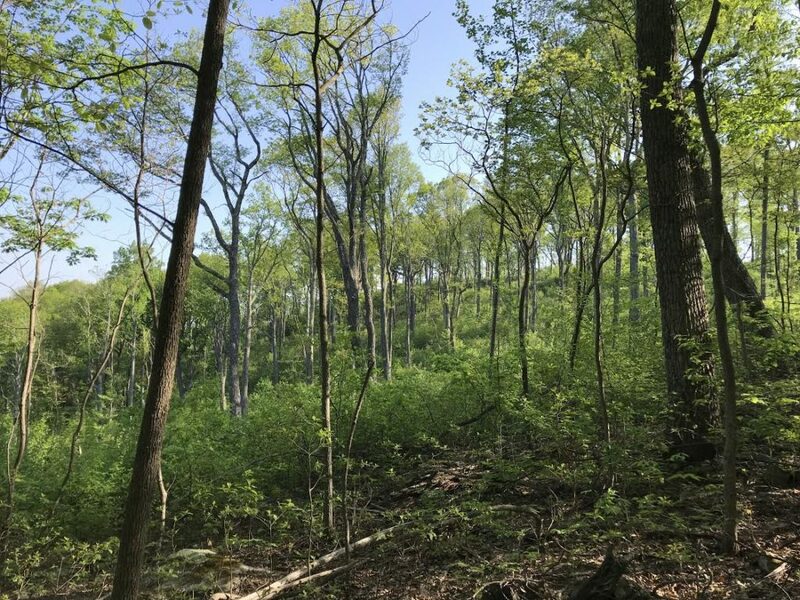 The project took place at DGIF’s Gathright Wildlife Management Area in Bath County, where strategic forest management over the past few years has contributed to maintaining an abundance of Cerulean Warblers. In spring of 2017, 13 geolocators were deployed and an additional 14 individual (control) birds were color banded over the course of a short but intense few weeks. This past May and June, an effort was made to collect the units by recapturing the birds, fresh from their return from their wintering grounds. Here in Virginia, over 100 unbanded birds were observed throughout Gathright and the surrounding area. However, only one bird bearing a geolocator was found (and successfully captured in its same territory from the previous season) by VCU; and only two banded birds without geolocators were observed. Similar low numbers were reported from other states involved in the larger study. We do not know why so few birds captured in 2017 returned to the study area. However, the single geolocator unit retrieved in Virginia holds a wealth of data on that bird’s movements over the course of a year, and we eagerly await results from the analysis. A similar Virginia project involving Golden-winged Warblers, another declining long-distance migrant, has yielded impressive results and some insights into the causes of its declines. Cerulean Warbler photo by Andy Reago and Chrissy McClarren. Participate in Virginia’s Second Breeding Bird Atlas, now in its third of 5 years, to help document the breeding status and distribution of Cerulean Warblers and many other bird species in the Commonwealth. Consider donating to DGIF’s Non-Game Fund, so that we can continue funding projects, such as this, that contribute to cutting edge research on Virginia’s Species of Greatest Conservation Need. Drink shade-grown coffee. Shade coffee plants in Latin America are grown under tall trees, which provides habitat for the Cerulean Warbler (and many other species) on its wintering grounds. The alternative, ‘sun coffee’, is grown as a row crop and is contributing heavily to deforestation. This article is brought to you by Virginia Department of Game & Inland Fisheries (DGIF), in support of the Year of the Bird, a celebration of birds that marks the centennial of the Migratory Bird Treaty Act (MBTA), one of the first laws passed to protect wildlife and one of the most important for birds. DGIF asks you to join your fellow wildlife-enthusiasts in this celebration by taking simple, meaningful actions to protect birds in 2018 and beyond.